Authors: Hind Nassar, M.D., Monika Roychowdhury, M.D. Cite this page: Roychowdhury M, Nassar H Cellular fibroadenoma of breast. PathologyOutlines.com website. http://www.pathologyoutlines.com/topic/breastfibroadenomacellular.html. Accessed April 20th, 2019. Contributed by Debra L. Zynger, M.D. 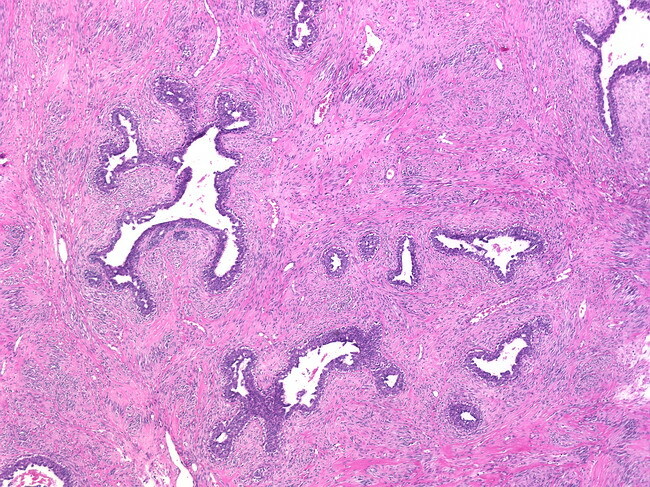 Which feature supports a diagnosis of phyllodes tumor over cellular fibroadenoma?